That works for Verena Schaer (L), Manager of FIATA Advisory Body Vocational Training (ABVT) and Milano-based Antonella Straulino (R), Foreign Affairs Manager of FEDESPEDI, FIATA Vice President, and Extended Board Member, pictured during the 2015 FIATA World Congress in Taipei. 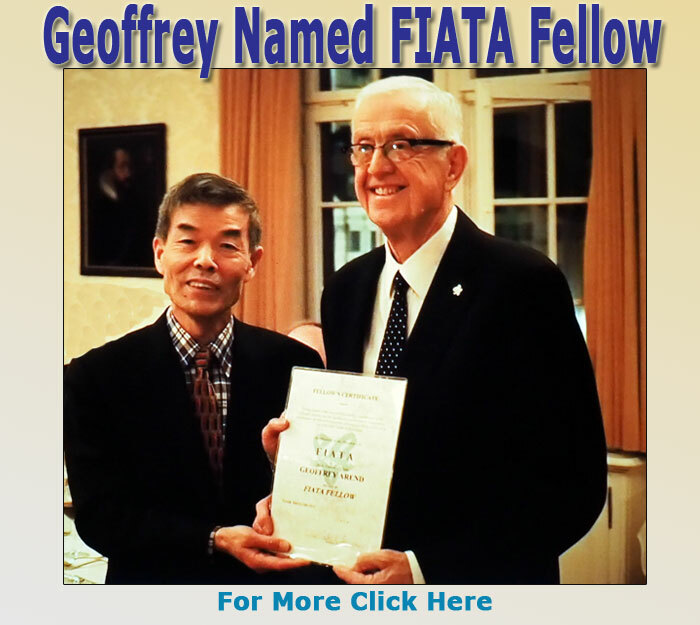 FIATA World Congress moves to Dublin, Ireland, October 6-8, 2016, and all are invited. There is a high, stark white wall Ashwin Bhat faces from his desk as Head of Cargo for SWISS International Airlines in Zurich, Switzerland. Just over his shoulder, a floor-to-ceiling window reveals the outside neighborhood and the ensuing seasons. But the white wall offered Ashwin a unique opportunity to forge a personal window on the world, so he took it. He placed a giant and colorful map of the world on his white wall, which may not be so unique, as business offices go. Lots of people with the kind of global responsibility that Ashwin shoulders include a map of the world in their office scheme. ‘Let’s take a picture in front of your territory,’ and it usually works,” he says. Ashwin also collects artifacts from his travels for Swiss WorldCargo; right now the collection is rather amazing and tells its own story of the growth, development, and keen understanding of an air cargo executive who climbed the ranks and appears to have no fear about succeeding a widely popular Oliver Evans. Ashwin Bhat has a plan, his eyes are on the prize, and every time he is in his office we imagine he is thinking about new worlds to conquer. Up Against The Wall at headquarters Ashwin Bhat is flanked by members of his executive team. To his right is Alain Guerin, Head of Cargo Marketing and to his left is Urs Stulz, Head of Central Services Cargo. “Our corporate results were excellent for 2015—record breaking, really. As an airline we had the third best report in history and for that we have to thank all our customers both passengers and cargo. “On the cargo side, the numbers were not so good with some reasons. “Firstly, our business was impacted by two external factors in 2015. “The decision of the Swiss national bank to peg the Swiss Franc to the Euro meant that when the Euro collapsed from 120 to 101 we were stuck flying with our usual high load factors; we could not compensate selling one Euro and getting one Swiss franc in return where previously we were selling one Euro and getting 120 Swiss Francs in return. “In other words, in 2015 the money conversion alone—where close to 80 percent of Swiss WorldCargo revenue is in foreign currency—accounted for about 50 percent of our decline during the year. “The other factor that impacted 2015 was the artificial first quarter uptick everyone experienced due to that U.S. West Coast dock strike, which drove unnaturally high numbers our way. “Unfortunately, for the remainder of 2015 business trended downward, with everything from yield to surcharges under tremendous pressure. “Now we are advancing our plan and look ahead to our offering for 2016. “I can say if somebody out there can forecast this year, lots of luck; what I can see this year will also be a challenge. Ashwin Bhat smiles and says, “We work at every point to stay close to our customers and let them now that we never forget how important they are. “Right now in technology we are on the second half of the chessboard, where the growth is exponential and where what we knew was happening during the last five years is changing rapidly to something completely different ahead. “So in such a grey rather than black and white world business situation, especially in air cargo, we need to have a positive attitude with the drive and will to succeed. “Swiss WorldCargo is confident of who and what we are and that is exactly what made our cargo business successful in the first place. “The second factor for us is that we are fielding an excellent team worldwide. “The name of the game is collaboration—not confrontation. “Our customers know that they can expect Swiss WorldCargo to lead the way in product offering and value for money. “All of the above and more come out in the exciting plans we have for the future,” Ashwin Bhat said. “Put simply, we are evolving as should be and working to be even more focused than ever before on developing and deepening our resolve to work into our strengths. “For example, Swiss has an image in the marketplace of being a high-priced resource. “While it is true that we are very high quality and we take immense pride in our product offering, and our services are priced accordingly, at the same time we are not unmindful of market conditions. “We sell air cargo and are in a world market that is operating under certain limitations, which Swiss WorldCargo both understands and competes with. “Our offerings, products, and services are not only superior, they are also competitive. As Head of Cargo, Ashwin Bhat is a member of the Board of SWISS International Airlines. “When it comes to running the airline, cargo has a seat at the decision-making table for the entire enterprise,” Ashwin Bhat said. Little wonder that today air cargo accounts for about 16 percent of the total throughput of the airline. “Swiss adds new B777-300ER services into Los Angeles in May 2016, offering 25 tons of uplift. “We have always flown with a high load factor (80 percent); even in a down market there is demand for our services,”Ashwin Bhat said. Swiss deployed its first Boeing 777 on regular long haul flights from Zurich to New York JFK from February 21 four times weekly, then switched to daily Montréal services on March 27. In mid-April, the B777s will add Hong Kong services, a route well suited for the aircraft, followed by Los Angeles (June), Bangkok (July), and then San Francisco and Sao Paulo. As the conversation wound down, Ashwin Bhat made the point that while remaining vigilant and ready for every opportunity, the work has also been a bit of an internal consolidation exercise. “Much of my work has been with the team, working alongside my people, developing ideas and strategies. “I like to be outside my office working alongside and amongst the people here in Zurich. “You learn about things in the day-to-day closeness of working together. “Collaboration is fine, but we need to virtually integrate our systems to create a seamless experience for our customers. “I think there is much to be considered from the start-ups of today and especially from the culture of bringing change faster. “A good idea in 2016 that takes until 2018 to implement is no longer acceptable in a world where changes are often put into force overnight,” Ashwin insists. “Sitting in my office at my desk one day looking at the blank white wall that lines one side of this room, I thought a bit about the canvas I have been given, leading the cargo fortunes of a great and storied international airline. “Of course, as we all know, air cargo is about people, so I thought this wall should represent the world we serve to bring a sense of the global village into our headquarters. “For example, the blue bowl on the wall with the image of fishes inside is from Hong Kong, and it says that everything you want in life should be yours in abundance and should overflow the bowl. “A small U.S. Presidential Seal on the wall sent from (where else?) Washington, D.C., proclaims that this is the enclave of ‘the commander in chief,’” Ashwin laughs. It's that time of year again: the 26th CNS Partnership Conference is back to bring together airlines and forwarders for a few days of golfing, networking, and comparing big ideas. The confab starts Sunday, April 10 in Nashville, TN. For more info click here. Taiwan-headquartered China Airlines is hoping free trade agreements under negotiation or already in place and high demand for niche cargoes and sports equipment will boost cargo demand as 2016 unfolds. CAL will introduce two B777s and four A350s this year; the B777 will fly the SFO, LAX, and JFK routes while the A350 will fly European and Australia/New Zealand routes. The capacity additions will mean overall cargo capacity is expected to grow by 2-3 percent during the year, but according to Jeremy Chang, Vice President of Cargo Sales & Marketing Department, there is room for some optimism this year, despite the barrage of bearish economic forecasts and indicators released recently. CAL also expects to benefit from its sea-air agreement with leading container line Yang Ming Marine. CAL signed an MOU with Yang Ming Marine in mid-November to form a “Sea-Air Grand Alliance.” The two companies then further expanded the strategic partnership to include Chunghwa Post last December in an effort to profit from the growing web commerce market by offering a new door-to-door delivery service. The Yang Ming collaboration consists of three services: “Cargo-to-Post,” “Joint Sea-Air Freight” and “Joint Air-Sea Freight.” Customers using “Cargo-to-Post” are able to ship ocean cargo from China to Taiwan where postal mail tags are attached before the cargo is exported via air cargo to the U.S. The “Joint Sea-Air Freight” product sees cargo from SE Asia and China transported by sea to Taiwan and Dubai before being sent by air to the U.S. and Europe. The “Joint Air-Sea Freight” service will see European/American cargo shipped by air to Taiwan and then transshipped to SE Asia by sea. “The conversion of Chinese cargo to postal service does not incur additional tariffs because the cargo to be transshipped by sea will enter the dedicated transshipment warehouse at Taoyuan International Airport,” explained Chang. “The mailbag tags will be added under the supervision of Customs or dedicated personnel. The converted mailbags are then exported directly by air. The joint sea-air/air-sea cargo is transported by bonded trucks to the bonded zone for transshipment so there are no additional tariffs either. Chang said the overall growth in demand for air cargo had been limited in the second half of 2015 due to continued weakness in the Asian manufacturing sector and lower-than-expected throughput from air cargo-related industries. Although full year volumes handled by CAL had not been released when FlyingTypers interviewed Chang, he said expectations were that volumes growth had been positive. “Growth in international Freight Revenue Ton-Kilometer (FTRK) is expected to reach 2-3 percent due to CAL’s continued optimization of our capacity allocation and development of potential market sources (e.g. changing the European transshipment hub to Dubai [DWC], the addition of Shenzhen [SZX] as a freighter destination, and additional freighter flights to Tokyo, Hanoi, and Ho Chi Minh City). “We have also strengthened our collaboration with international couriers, SkyTeam Cargo, and sea freight operators to develop new courier sources and joint sea-air freight business opportunities,” he said. Chang said one of the bright spots last year was the performance of the Transpac lane, which was “outstanding,” not least because of the cargo backlog at U.S. West Coast ports between late 2014 and 2015 Q1 driving up demand for charter flights between Asia and the U.S. and also pushing up U.S. shipping prices. On European lanes, overall cargo demand remained flat last year due to the slow recovery of the economy and manufacturing sector. “Measures such as the switching of transshipment hub to DWC, reducing of freighter capacity as necessary, and operating 777s with large holds for FRA, however, should see the European lane outperform last year’s results,” he added. Although it has often found itself—alongside its Middle East peers— caught up in rows with regulators and competitors (mainly in Europe) about how it has funded and managed its expansion, there is no doubt that Etihad Airways is a major star in the world of air freight even when markets are stubbornly slow. In 2014 Etihad Cargo recorded a 19.2 percent year-on-year surge in cargo revenue, which totaled $1.11bn, aided by a 16.8 percent increase in freight and mail volumes to 569,000 tons. Its cargo division produced a “standout performance,” said the Abu Dhabi-based airline, while industry veteran James Hogan, the carrier’s Australian president and chief executive, saluted Etihad Cargo, adding that it “has consistently outperformed the global market” and its “impressive 17 percent growth in freight ton kilometers in 2014 is four times the industry average.” High praise, indeed. Growth was a bit slower in 2015, but it has still been eye-catching given the disappointing growth in world trade and the bearish nature of cargo markets for much of the year. David Kerr, VP of Etihad Cargo, attributes the growth to the continued expansion of the airline’s global passenger and cargo network, and the addition of new passenger aircraft to the fleet, which have provided extra bellyhold capacity. “We have also rolled out new cargo products designed to meet the specific needs of customers, and the strong export and import demands between financial centers and key emerging markets,” he told FlyingTypers. “During the first half of the year the airline launched new passenger services to Kolkata, Madrid, Entebbe, Edinburgh, and Hong Kong to complement our existing global network, enabling Etihad Cargo to extend its reach and offer bellyhold capacity to new routes in India, Africa, Europe, and Asia. “Last year we also launched Tempcheck, a new cargo solution created to ensure the integrity of all temperature-sensitive pharmaceutical and healthcare products as they are transported around the world. Etihad currently operates a fleet freighter aircraft to 38 destinations on its passenger network, while its freighter-only routes serve key cities around the world including Bogotá, Chittagong, Dar es Salaam, Djibouti, Dubai World Central, Eldoret, Guangzhou, Hanoi, Hong Kong, Houston, Kabul, Miami, Sharjah, and Tbilisi. An additional two B777Fs are due to join the fleet this year, joining its current freighter roster of three Boeing 777Fs, three Boeing 747Fs, and four Airbus A330Fs.